Pioneer Drama Service is proud of its roots in Cody, Wyoming and its long-time reputation as “The House of Melodrama.” We can honestly brag there isn’t a broader and larger selection of melodrama plays anywhere in the world! Ranging from traditional melodrama such as The Drunkard that reinforce a code of ethics to punny, silly romps that can best be typified as meller-drammers, your school, church or community theatre will find a show that’s a perfect fit for your needs. 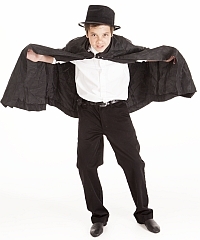 In addition, we are proud to offer Between Hisses, the only source of sheet music for all the melodrama themes your audiences expect to hear, such as the villain’s entrance, the hero to the rescue or the heroine’s abduction. 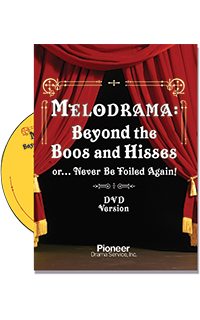 If you prefer, pre-recorded music is also available as a CD, and our DVD will teach your actors everything they need to know about the unique art of melodrama, complete with olios and an introduction by the master of ceremonies. Pioneer Drama Service is pleased to offer 2 texts and CDs in this category.